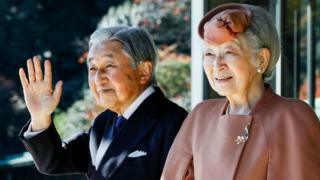 Japan's ageing Emperor Akihito will step down in April 2019, marking the end of an imperial era for Japan. Prime Minister Shinzo Abe announced the abdication date shortly after a government and royal panel met to discuss the timing. The timing of his abdication, the first in more than two centuries, has been the subject of debate in Japan. The Imperial Household Council, made up of Mr Abe, lawmakers, and members of Japan's royal family, convened on Friday to set the date of the abdication. Mr Abe later met reporters briefly to announce that they had decided the emperor would step down on 30 April 2019. His abdication will mark the end of the Heisei era, and he would be immediately succeeded by his son Crown Prince Naruhito on 1 May, which would start a new imperial era. What does the emperor do? The emperor has no political powers but several official duties, such as greeting foreign dignitaries. Japan's monarchy is entwined in the Shinto religion and the emperor still performs religious ceremonies. What do Japanese people think? Most support the emperor's desire to abdicate - a survey by the Kyodo news agency after Akihito suggested he wanted to step down found more than 85% saying abdication should be legalised. Why is the abdication timing contentious? Earlier reports said the emperor could abdicate on 31 December so that his son would start his era on 1 January, thus synchronising the imperial calendar - which is still used for formal announcements - with the Gregorian calendar widely used in Japan. But the royal household reportedly rejected this as ceremonies to mark the succession would then clash with year-end and new year royal events, reported Kyodo news agency citing government sources. The emperor, who has had heart surgery and was treated for prostate cancer, has been on the throne in Japan since the death of his father, Hirohito, in 1989. In a rare address to the nation last year, Akihito said he was "worried that it may become difficult for me to carry out my duties" with his declining fitness, and expressed concern for the strain imposed on his family and Japanese society if he fell ill and died while on the throne. His statement was widely interpreted as a wish for abdication, which at the time was not provided for under the law. Public sympathy grew for the emperor, and the Japanese government moved to enact a bill this year to allow him to step down. It is a one-off piece of legislation, and does not allow Naruhito or his successors to abdicate. Naruhito: Will Japan's crown prince be a 'fresh breeze' for the monarchy?